Revelation 3 - BREAKING NEWS: (Yes, it is!) - StrictlyMathematics.com - Strictly Mathematics - Knowing is Winning! When you look as some of the most remarkable PICK 3 SYSTEMS of all times, the QUICK PREDICT X system, the “Classic” Wild Wheel, the “Straight” ZID SYSTEM, the “Legendary” Jack's MAGIC WHEEL and many others you might think what else can there be? When you ask players what they want from a system you hear as many different answers as there are systems and more. Some want only a few numbers, others want a variety of numbers – either boxed or straight, some look only at pairs, others at key numbers. Some want to change the numbers daily, others want to play the same numbers for a certain period of draws. Some want to able to adjust the numbers themselves, others do not want to do any research at all. But one thing they all have in common: The expectation to win consistently. And the numerous Pick34.com and STRICTLYMATHEMATICS.COM systems available are fitting everyone's need. You just need to know in what player category you fit in and the right system is there for you. This new system tries to accommodate all kinds of players. It provides numbers for every budget and playing style, allows you to pick the numbers that are meant for you. The system provides you with 9 different playing selections at once. If you are only looking at a few key numbers, a pairs selection, a quick selection of 5 numbers to play, this is the system for you. If you like more numbers – singles and/or doubles - there are 6 more selections for you to pick. These selections can be played or – if you enjoy research – they can be used as a base for further reduction. Selected for best position the numbers are optimized for Straight hits. If you like to change your numbers daily you can create a new selection daily, if you like to play your numbers for a longer period of draws? No problem. The system is designed to allow both without reducing the chances of selecting the best numbers possible. 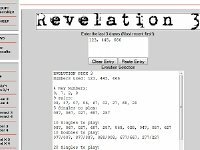 REVELATION 3 is loosely based on the some of the most powerful systems available through the Pick34.com and STRICTLYMATHEMATICS.COM programs. It took many months to develop this new system to get to the current standard. It can even be used as a training and improvement tool. Simply by back-testing its results and comparing the different selections you can easily identify what selection is the best to use in your state and what playing style can improve your quality of selection. Also – because you have access to all choices at once – it is also easy to adjust the playing style when necessary. The input from many players, the power of systems such as the QUICK PREDICT X system and others, the long testing phase and incredible volume of data used to finish the system combined created a system that will impress and deliver some of the best number selections possible for Pick 3 lotteries. Straight hits in numerous states throughout the testing phase prove the power of the system's selection algorithm, the consistency in some cases is astounding, the playing options are chosen wisely with the player in mind., the concepts used are unique and no previous knowledge or training required. Currently the system is available for PICK34 SPECIAL USERS GROUP Members only. The software will come out as as a downloadable software in early May 2010. Interested players can try it out in the Group. If you are currently not a member you might want to join for a trial period or a month to be one of the first to evaluate this new system.